Doylestown: A pathway through history - Times Publishing Newspapers, Inc. Roads resemble the veins of a human body – intricate, connected systems necessary for prosperity and upkeep of society, life and health. Building roads was the first step in founding William Penn’s Quaker Empire west of the Delaware, and these roads became a large basis for what would one day be known as Doylestown. Last year marked the bicentennial of Doylestown Township. In 1814, residents of New Britain and Warwick townships petitioned the Court of Quarter Sessions for the establishment of the township. Doylestown Township first took root at a crossroads anchored by 18th-century taverns and was formed from parts of existing townships – Warwick, Buckingham, and New Britain – which were populated by English Quakers, Scots Irish, and Welsh settlers. Built on the original 20,000 acres of land which William Penn conveyed to the Free Society of Traders in 1682, Doylestown was largely broken up and sold by the Society. Jeremiah Langhorne was one of the earliest settlers and largest landowners in Bucks County at the time, and he bought large amounts of land from the Society. Nearly half of the land he purchased was located in Central Bucks, and the fact that he was selling land was a large draw for many settlers. This is probably what first brought the Doyle family to this prosperous, growing area. The Doyle family originally came from France (where their name was D’ouilli). William Doyle petitioned the county seat, Newtown at the time, for a license to keep a public house and subsequently opened Doyle’s Tavern at the northwest corner of State and Main streets where Starbucks is located today. Doylestown became the county seat in 1810. County residents sought a more central location following the Revolutionary War as northern Bucks County’s population grew over the 18th century. That year a local stagecoach began running through Doylestown, making it a hub for travel by connecting it to Philadelphia and Easton. Doyle’s Tavern was the seed that blossomed into this well-known town. Although the Doyles eventually moved to New York, they left the country crossroads with their namesake. 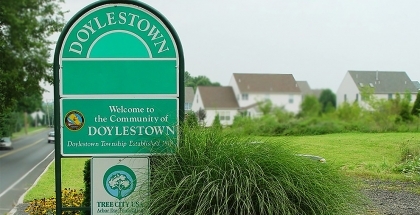 Doylestown Borough was incorporated in 1838 when the growing village center detached itself from the township. In 1897, Joseph Krauskopf, a leading reform rabbi in Philadelphia, founded the National Farm School. Leo Tolstoy had encouraged him to build a farming school for Jewish immigrants similar to farm schools in Russia, and Joseph chose Doylestown for its close proximity to the city and abundance of farmland. In the 20th century, the school became known as Delaware Valley College before becoming a university in 2015. The land for the township’s Central Park was purchased from DelVal in 1991. Since the purchase of the park, the township has added hiking and nature trails, a pond, a community center, an environmental education center, bocce courts, and pavilions and picnic areas. Rather than destroy structures whose original purposes have long since faded, residents of Doylestown take care to adapt them to modern needs and traits which contribute to its identity. A couple notable structures include Henry Mercer’s Fonthill, built in 1910 and also known as Fonthill Castle, along with William Mercer’s Aldie Mansion, built in 1927. Both estates enrich the community with their presence and architectural design. Today, Fonthill operates as a museum for the public to tour while Aldie Mansion is home to the Heritage Conservancy, which is dedicated to preserving the environment. Doylestown is embracing the future while preserving its abundant heritage and all that makes it a unique community. Most of the roads built back in the 18th century still exist today and have only become better traveled as the years pass. Doylestown continues to draw people for its exceptional atmosphere, picturesque landscape, and classic architectural wonders. *Oscar Hammerstein II Museum & Education Center.